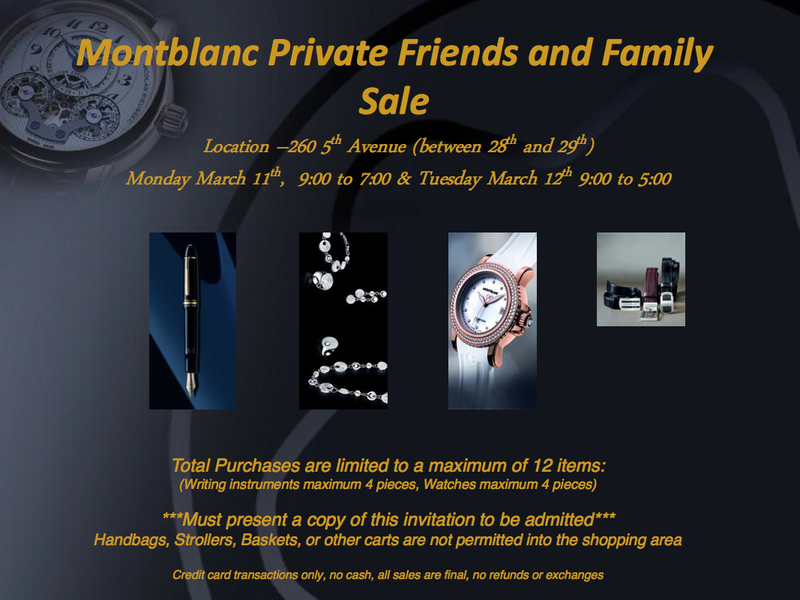 Montblanc's "private" friends and family sale is always a great place to pick up sophisticated gifts without breaking the bank. This sale is usually a reader favorite. Although it's dubbed private it's not. Period. Last season the sale moved to a new location and was taken over by sample sale professionals. Regular shoppers of the sale were not happy. Shoppers wrote that they waited upwards of two hours and were only given 30 minutes to shop. One Montblanc fan said she made it into the sale at noon all the rollerballs or ball point pens were already sold out. Those who got there earlier found watches, pens, jewelry, bags and accessories. Most items were 65% off and leather goods were 75% off. All the pens that were under $300 went very quickly-- as illustrated above. A limited selection of watches were more $1000. Cufflinks ranged in price from $100 to $300. The sale is only two days, starting Monday. There is no restocking and loyal fans turn out in mass for this discount opportunity. Those planning to majorly stock up should be warned that there there is a maximum of five pieces for each shopper.